Frank was born in 1881, the son of William Lewis and his wife Sarah née Fisher. His date of birth can be deduced quite accurately from the 1881 census record of the family in which his age is given as ‘6 days’. As the census was taken on 3 April it can be assumed from this that he was born on 28 March. The family was a small one for the time; he only had two siblings - Henrietta (born ca 1875) and Charles Ashley (1879). Charles died aged 4 in 1883 being buried in Newtown Road Cemetery on 23 November. Information on the family is extremely scarce from this date for over twenty years. It is possible that William and Sarah died in 1890 and 1887 respectively, but the evidence in not conclusive, for instance the Sarah Lewis who died in 1887 was living at Falkland Terrace, Andover Road, the residence at the time of a boiler maker called Joseph Lewis, so it is probable that it was his wife who died, not William’s. Whatever their fate no further information about Frank’s parents and sister has been uncovered. In the 1901 census a Francis G Lewis appears as a journeyman baker at Seward’s bakery in Cheap Street, but, this was not Frank who was working as a farm labourer at Adbury Park Farm just over the Hampshire border in Newtown. The young baker was from a little further over the border, Ramsdell near Basingstoke. By 1906 Frank had left the farm to work as a house painter based in Newbury (Baverstock’s in Old Newtown Road). 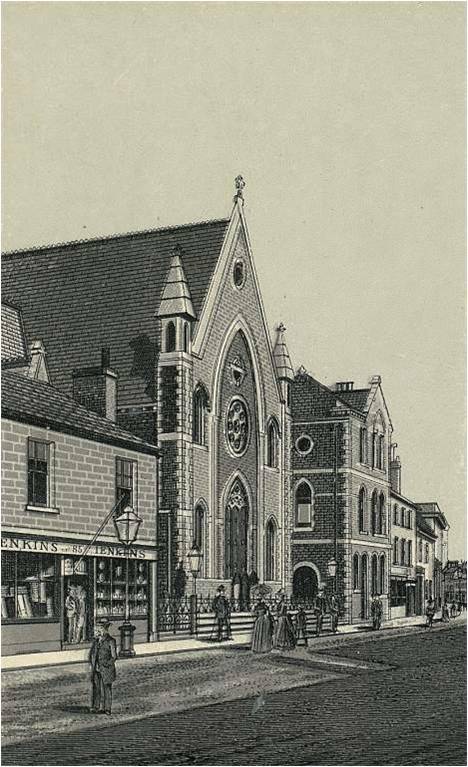 On 2 June that year he married Rebecca Pocock at the Primitive Methodist Church in Bartholomew Street. The couple set up home at Hope Cottage, Old Newtown Road, where the household included Rebecca’s mother, Rebecca Dennis and brother John Pocock. The family grew with the births of Violet Beatrice in 1910, Kathleen in 1911 and Edward Francis George in 1914. Sadly young Edward died in 1915 before his first birthday. Newbury Weekly News 21 November 1912. A removal van towing a trailer similar to the one involved in the tragic accident witnessed by Frank. When war was declared Frank volunteered to serve in the local Royal Berkshire Regiment, probably not as soon as the war broke out since he was not posted to one of the new battalions formed in the opening weeks of the war. Instead he served with the 1st Battalion, the Regular Army battalion that landed in France with the British Expeditionary Force on 13 August 1914 and had been through many battles before Frank crossed the Channel on 18 May 1915. As he landed in France the 1st Battalion was in action at Richebourg l’Avoue where they took a leading role in an assault on the enemy’s line a few days earlier (15 May). On 19 May the battalion was withdrawn from the line to rest billets at Allouagne where the 24th Reinforcement of 107 other ranks joined the battalion on 22 May – this probably included Frank though he may have arrived with the 25th Reinforcement (118 other ranks) on 30 May. 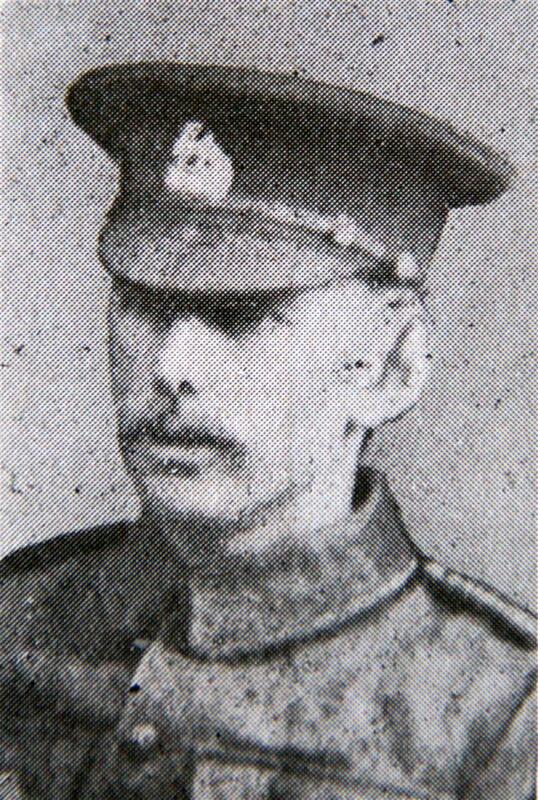 Another newcomer on 22 June was a lad from Thatcham, 2nd Lieutenant Alec Turner; he was posted to B Company. Frank’s first months with the battalion were relatively uneventful; in and out of the trenches at Grenay, Cuinchy and Givenchy. At Cuinchy they were in trenches recently taken over from the French; here they were involved a sniping contest with the enemy and an underground war, some of the men helping out with mining and counter-mining activities. Even in billets they were not always safe - at Cambrin an enemy shell hit the officers’ mess and killed the CO, Lt Col C G Hill, DSO. In late September the British launched their biggest offensive of the war to date – the Battle of Loos. 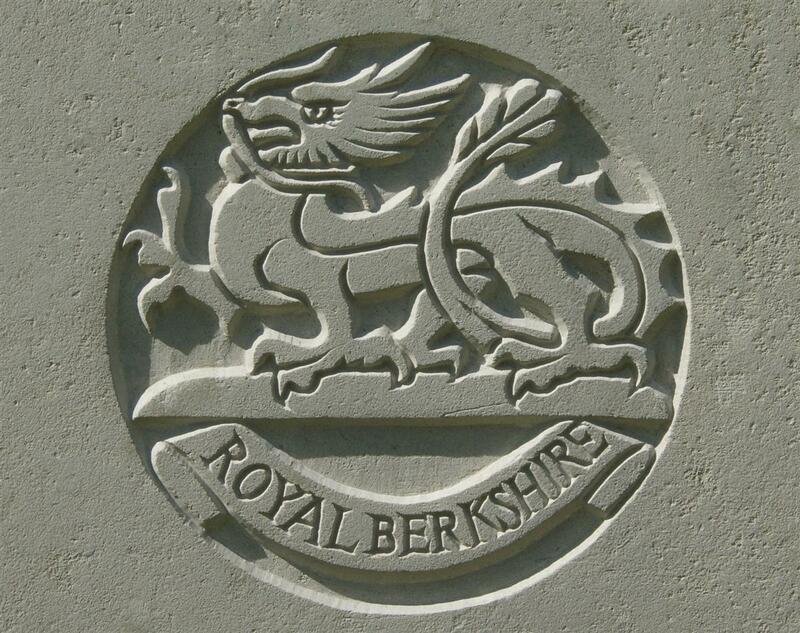 The 1st Battalion, Royal Berks was in reserve on the opening day of the battle (25 September), two other battalions of their brigade (6th Brigade, 2nd Division) where tasked with the opening assault. These battalions, the 1st King’s Liverpool Regiment and 2nd South Staffordshire Regiment, suffered badly when the wind changed and gas released by the Royal Engineers blew back into them and the 1st Royal Berks were called forward to man the line in case of counter-attack and help deal with the casualties. Late that evening they were withdrawn from the trenches and temporarily transferred from the 6th Brigade to a ‘Provisional’ brigade along with the 1st King’s Royal Rifle Corps and 2nd Worcestershire Regiment - commanded by Lt Col B C Carter and hence known as Carter’s Brigade. The new brigade was tasked with an attack on a mine called Fosse 8 north of Loos. At 02.30 on the morning of 28 September the battalion began to move forward over 800 yards of captured German trenches towards their objective; while still 400 yards short they were spotted by the enemy in the bright moonlight. They pressed forward but were held up 70 yards short of the slag heap that was their prime objective. “For most conspicuous bravery on the 28th September 1915 at Fosse near Vermelles. When the regimental bombers could make no head-way in Slag Alley, Lieut. Turner volunteered to lead a new attack. He pressed down the communication trench practically alone, throwing bombs incessantly with such dash and determination that he drove back the Germans about one hundred and fifty yards without a check. His action enabled the reserves to advance with very little loss, and subsequently covered the flank of his regiment in its retirement, thus averting a loss of some hundreds of men. Lt Col Carter ordered one more attack on the slag heap, which made some headway but not enough; the Colonel then ordered the battalion to reorganise in the old trenches. Casualties were heavy, among the ‘other ranks’ 17 were recorded as killed, 115 wounded and 143 missing. Most of the missing were killed that day, either in places where their bodies could not be recovered and identified, or in a manner that left their remains in an unrecognisable state. Notification has been received by Mrs Lewis of 3, Stanley-terrace, Park-lane, Newbury, of the death of her husband, Pte Francis George Lewis, Royal Berks. He had been reported missing since September 28th, 1915, and his wife addressed a letter to the King of Spain, and sympathetic letter from His Majesty’s private secretary, stating that he would cause enquiries to be made in Berlin, earnestly hoping that this would be the means of procuring satisfactory information. Unfortunately the official reply, although relieving anxiety, confirmed the worst fears. A letter of sympathy has been received by Mrs Lewis from King George and Queen Mary. The news item demonstrates the desperate measures relatives would take in the hope of finding their loved one alive. Neutral nations such as the Spanish, Americans and Swiss were used as intermediaries able to carry out enquiries within Germany. The darker side of human nature was demonstrated by some unscrupulous opportunists who profited from the desperation of the relatives taking money to carry out spurious investigations. LEWIS – Pte F G Lewis, dearly beloved husband of Rebecca Lewis, aged 34. Previously reported missing, now reported killed September 28th, 1915. Permits them to mingle with those they still love. From his sorrowing Wife and Children, Violet and Kathie. Frank’s body was never identified; his name is remembered on panel 94 of the Loos Memorial to the missing at Dud Corner Cemetery just outside the village of Loos-en-Gohelle. 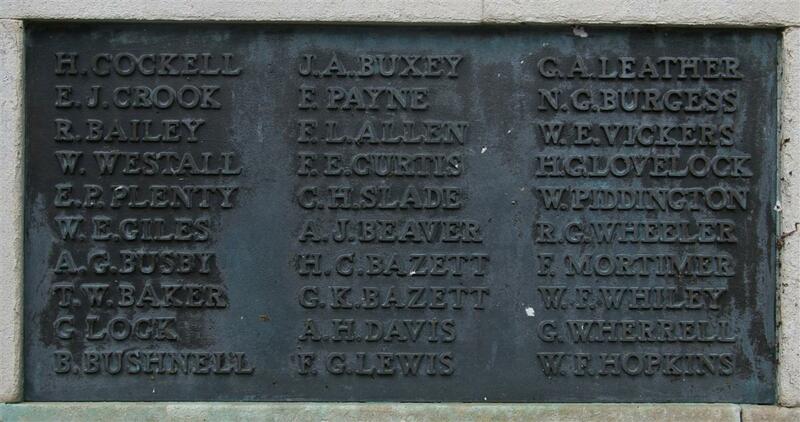 Frank's name on Newbury War Memorial. Locally he is remembered on tablet 9 of the the Newbury Town War Memorial and the Speenhamland Shrine, which is the parish memorial for St Mary’s, Speenhamland – when St Mary’s was demolished in the 1970s the shrine was moved to its current location, St Nicolas’, Newbury. As can be seen from the report of his death, Rebecca and the children were living in Stanley Terrace, Park Lane in Speenhamland; it is not known whether the family made this move before Frank signed up though it may have been made necessary by his enlistment, for instance if their cottage in Old Newtown Road came with his job. In 1920 Rebecca remarried to Alfred Gigg and moved to Great Bedwyn. A tragic affair happened on Thursday afternoon. The children were leaving St. John's Infant School, and in the freedom from restraint they rushed out into the road heedless of danger. A traction engine drawing two furniture vans had come down the Andover-road and was close to the “island” recently constructed to afford safety for children. The vehicles were proceeding slowly, as the driver was on the look-out for traffic at this converging point. By some means- it seems almost impossible- a little fellow of six years ran out from the “island,” got between the vans and was endeavouring to get up and ride on the connecting bar. He was swinging for a time, and then fell back underneath the van. The wheels passed over his head, crushing the skull, and mercifully death was instantaneous. The children who had been all gaiety a minute before and laughing at their companion's daring, were now shrieking with terror. It was a painful scene which unnerved older people who had witnessed it. Mr. James Baverstock, who had previously noticed the boy's danger, went and picked up the poor little mangled body and carried it into the Hospital, only a few yards distant, but there was no necessity for surgical treatment. The boy who had met with such a dreadful end was Henry Arthur Reginald Crouch Burden, the six year old son of a postman living in King's-road. The traction engine and vans were the property of Messrs. Wright and Pankhurst, furniture removers, of Rye, Sussex, and were returning from a journey to West Woodhay. The men in charge stopped for the night, and telegraphed to their employers. Mr. Wright, one of the firm, immediately travelled to Newbury, attended the inquest, where he expressed the greatest sympathy with the bereaved parents, and although it was conclusively established that there was no liability, he generously offered to pay the whole of the funeral expenses. It was unquestionably an accident, caused by the thoughtless daring of the boy, trying to get a ride on the connecting bar. It was impossible for the driver or the men behind to see what he was doing, and his sad death was caused by his own action. Nobody else was to blame, and the jury fully exonerated the driver. The inquest was held on Friday evening in St John's Parish Room by the Borough Coroner (Dr. W.B. Heywood), and a jury of whom Mr.A.C. Bishop was foreman. Henry John Reginald Couch Burdett, 3 Prospect Terrace, King's-road, identified the body as that of his son, aged five years and eleven months. James Baverstock of Newtown-road, said on Thursday afternoon at 4.15 he was driving home and near the church he passed in front of a traction engine drawing two furniture vans coming from the direction of Andover-road. After he passed he saw a little boy trying to get on the connecting bar between the two vans. Witness said to his man, “Oh Frank, that boy will be killed.” He was pulling up his horse to run back, when he saw the boy fall back, and both wheels passed over his head. The body was underneath the van, the wheel just catching the upper part of the head, which was smashed. Death must have been instantaneous. He went back and picked up the body and carried it to the hospital. The child was quite dead. The Coroner -What pace was the engine going? -Between two and three miles an hour. A juror- Was there anybody behind to give notice?- I did not notice anyone. The Coroner- Were there children about?-Yes they were all laughing one minute, and the next they were squealing like rabbits. It was a pure accident. Francis George Lewis of Hope-cottages, in the employ of Mr. Baverstock, said he saw the boy swinging on the connecting bar between the two vans., and he saw him fall, the wheels passing over his head. The vans were travelling slowly, between two and three miles an hour. It was impossible for anyone to see the boy. Job Robbins, of 6 Adelaide Terrace, Rye, Sussex, said he was driving the engine, but he knew absolutely nothing of the accident until one of the men ran up and told him to stop. There were four men and two of them were standing on the back platform of the last van. As near as he could say they were travelling about two miles an hour. H e noticed a few children about, but he was more engaged in looking out for motors at the cross-roads. Foreman- It is your duty to look out forward, was there any means of your seeing what was happening behind? Witness- No, my duty on coming to a crossing is to see there is no traffic in the way. I expect children to keep out of the way. There is nothing to prevent them getting on the van. If you speak to them they only turn and cheek you. A juror- Was there no connection between the engine and the last van? Mr. Wright the owner, said there was a rope connection by which a man at the back could ring a bell on the engine, and it could be stopped immediately. There was a man riding behind, and he rang the bell directly, while a man ran forward to stop the engine. Mr. Kimber said that children were very reckless. He had seen a motor-car with four children riding on the back. The Coroner said the accident which happened some time ago had largely prevented accidents. Children had been stopped from spinning tops in the middle of the streets. Sergt. Rufey said the police now seized any tops being used by children in the streets. Mr. Empson said they played football in the streets outside his shop. Mr. Baverstock remarked that they ran out in front of his horse . He thought it would be a good thing if a constable could be stationed near each school when the children came out of school. The Coroner:- There are a lot of schools and you would want a lot of constables. Sergt. Rufey- It would require all the police in the borough. Robbins, the driver, said he had known a case where one girl knocked another down right in front of the engine. The Coroner: Parents ought to punish children for playing in the streets. The Foreman- It is quite true. They do not punish them. Mr. Harry Brown- How can they be always after them? Children will play in the streets, and considering the number of motor-cars about the accidents are very few. Two or three thousand pass my house daily, and there has not been a single accident for three years, which speaks well for the carefulness of the drivers of vehicles. Children have not adapted themselves to the new motor traffic. The Coroner- But this was quite slow traffic. Mr. Brown- It was an unfortunate accident and nobody was to blame in the matter. The Foreman said the jury were agreed that the death was accidentally caused, and the entirely exonerated the driver from all blame. They desired to express sympathy with the parents in the sad loss they had sustained. Mr. Wright said he wished to express his regret at the accident, and add his sympathy with the parents in their sad trouble. He had made arrangements to pay the wholeof the funeral expenses of the child. His men had been travelling thousands of miles over the country roads for many years, and their instructions were to be as careful as possible when passing through towns or approaching schools. This was the first accident they had ever had, and he much regretted it, although it did not seem that his men were to blame. The Foreman-It speaks very much for the great care exercised by your men. The deceased boy's father thanked Mr. Wright for offering to bear the funeral expenses. The jury gave their fees to the father. The funeral of the deceased boy took place on Saturday afternoon in the Cemetery, and the little coffin was covered in flowers from his sorrowing school fellows and friends. One came from St' John's School with the inscription “In loving memory of Reggie, from his little school-mates.” He was a genral favourite being a smart bright boy. The mourners were the father and mother, two grandfathers and two aunts. The funeral expenses were generously borne by Mr. Wright, the owner of the traction engine.